When a dentist combines great skill, technology and patient-centeredness, he’s the Erlanger dentist for you. Find the best dentist serving the Independence, KY and Erlanger, KY area in Dr. Danny Nakhla. 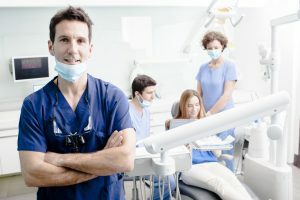 Piggybacking with at-home brushing and flossing, in-office preventive services stop disease early and lessen the seriousness and cost of problems if they do occur. Gum disease and dental decay lead to tooth loss and systemic health problems such as heart attack and diabetes. When diagnosed, your dentist in Erlanger restore teeth to optimal health with a wide array of modern treatments that avoid tooth loss and replace teeth if loss occurs. Dr. Nahkla insists on today’s latest dental technologies, too, including intraoral cameras to spot hidden decay, digital x-rays, which are low in radiation and facilitate paperless storage, and Galileo 3-D Cone Beam scans. These 14-sec scans give Dr. Nahkla a sharp image of teeth, roots, gums, bones and other supporting tissues for complete picture of a patient’s oral health. And he does it very well. Dr. Nakhla prides himself on up to date skills and compassionate care for each individual patient that comes through his door. Find great dental care at Independence Family Dentistry. Contact the office today for your one on one consultation.